“I love to entertain and everybody always wants to be in the kitchen,” says Deborah Eckland of Edina, who with her husband Jeff built their Edina home in 1999. “I love to have people in my home, make a big pot of something and just be together.” After hosting a party where her guests were crowded in a corner and some even sitting on a cooler, the homeowners knew it was time to make some changes in the kitchen. “I also watch way too much HGTV, and thought, ‘oh my gosh, if they can do that with that flop of a house, I’m sure they can do something to make this one more functional,’” says Eckland. They enlisted Vujovich Design Build to complete their remodel. The original kitchen had stock honey oak cabinets that did not maximize the existing 10-foot ceilings and lacked crown molding. There was a small island with a white Corian countertop that didn’t offer much in the way of seating or counter space. However, the great room was expansive. With some reworking, the team at Vujovich transformed the existing space to create the Eckland’s dream kitchen. The result is an elegant area as refined as it is welcoming and comfortable. The project was also recognized with a Contractor of The Year (COTY) award for the best kitchen over $150 thousand by the National Association of Remodeling Industry. The kitchen remodel was a part of an entire home makeover, and the project took about four–five months. The Ecklands, along with their high school aged son, moved out of the home during the remodel. For this remodel, the footprint of the existing space was maintained, however the window and door placements were reworked and shifted downward to increase the space available for kitchen cabinets and countertops. To improve the flow, they also removed the walk-in pantry and created a 16-foot wall of pantry cabinets including the refrigerator/freezer with cabinet face and reworked the butler’s pantry. This allowed them to add a large furniture-style island in the middle of the space, with turned legs in a soft slate blue, and a double thick Cambria countertop, with seating for four. The 3-inch plank oak floors were refinished in a deeper stain. The cabinets enameled in a classic white. New custom cabinetry creates a grand feel and offers an increase in storage. Worn glass fronts with lighting help showcase items. The space also features new appliances, a farmhouse sink and is adorned with grand light fixtures. “We tend to work in a lot of older homes in the lakes area of Minneapolis and so a lot of our stuff is kind of a nod to the past and the white classic kitchens are something we do. But we also do them in fun grays and greens and fun paint colors sometimes, too, or in riff oak,” says Malmberg. 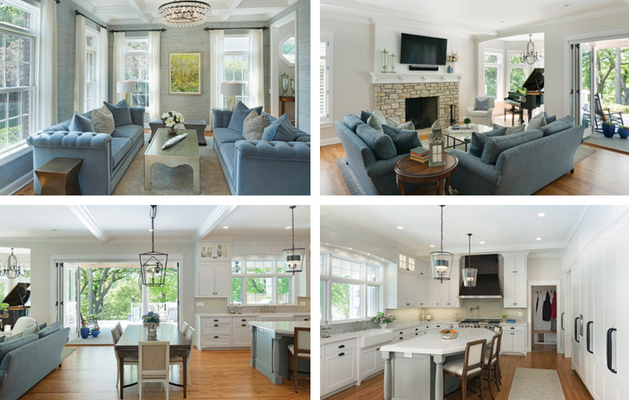 To increase that Southern charm and feeling of a classic Georgian style home they intended, the team at Vujovich made interior and exterior changes to improve the authenticity of the style the homeowners were looking for. “It still is a very large space without definition between rooms, but we used slight eyebrow arches throughout to help define the spaces. There are arches in the cabinetry, the valance over the kitchen window and an archway over the new pantry wall,” says Malmberg. They also added more architectural elements like beefy crown molding and beams, creating giant coffers on the ceiling. The team also replaced a standard patio door with impressive bifold doors that have full-view sheets of glass and open from the casual dining area in the kitchen onto a huge back porch overlooking a lake.